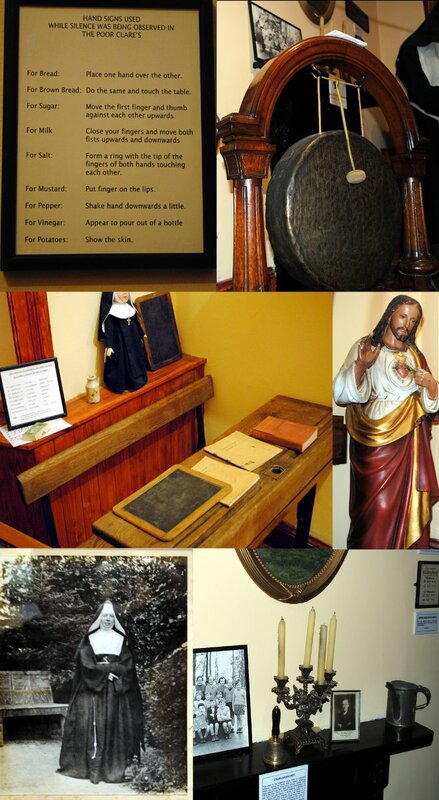 Once a convent of The Poor Clare order of nuns, it is appropriate that Cavan County Museum tells something of their story. The nun's story in Ballyjamesduff began in the early 1870s, when Bishop Conaty petitioned the Poor Clare communities in Cavan and Newry to found a new house in Ballyjamesduff. The 6th of February 1872 saw the arrival of the first members of the new community, who were then situated on Dublin Street. Within a short time, the convent became congested due to an increase in vocations. Nor did the building they were then in suit their needs as an enclosed order. In 1880, therefore, a 14-acre site was purchased for £450 for the new convent with plans to build a school for 200 children. 1883 saw the sisters move into their new convent, which was built at a cost of £14,500 by the famous architect, William Hague Jr. In the early 1930s, the nuns bought the two avenue fields which would later form the sites for the local church and the priest's house. Ever mindful of the demand for education, a new school wing was opened in 1956, followed five years later by a 'Secondary top' school, opened under Sr Carmel, principal of the Primary School. A year later, under the guidance of Sr Bonaventure, a secondary school was opened in the convent with an enrolment of 81 pupils. In the mid 1960s, work began on the new church to be built on the convent avenue. St Joseph's church was blessed on 29 September 1966. The 1960s was a time of change for the sisters, when, in accordance with the second Vatican Council, the convent chapel was adapted and the nun's habits and veils were exchanged. In 1992, the dwindling community closed the convent and moved to Percy French Park, while the convent was sold to Cavan County Council to house the new County Museum.